Could we be swapping the home button for a slick edge-to-edge screen? There's not long to go now until Apple launches the much-anticipated iPhone 8. 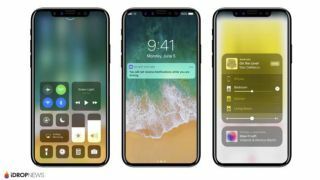 Apple fans have been speculating wildly about what to expect from the new device, which is predicted to ship on September 12. Thanks to some careful investigation and leaked specs, it looks as though the iPhone 8 is heading towards a radical overhaul – including a very different design and new components. One of the biggest questions for creatives is how good will the screen be? Fans have been calling out for a larger screen that looks more stylish and has a higher resolution than the iPhone 6 display. If the rumours are to be believed, we could be in for a treat: it's predicted that the iPhone 8 will have a smaller frame that allows for an edge-to-edge 5.8-inch screen. According to our sister site TechRadar, the screen is also tipped to switch from LCD to a richer AMOLED display, which would deliver better contrast, more vibrant colours and be better suited for VR and AR. Finally, there's talk that the iPhone 8 could additionally sport a mild 2.5 curved edge (think along the lines of what we saw with the iPhone 7) although it won't be as sloped as those on Samsung phones. The idea of an edge-to-edge screen has met with a mixed response. Some are overjoyed at the prospect of playing around with the screen display; others are concerned this design will just make it easier to break. What does seem certain, though, is that the iPhone 8 will have a small lip of bezel coming down from the top of the phone. This is likely to contain the earpiece, front-facing LED flash and camera. There's no news yet on whether or not the headphone jack will make an appearance after controversially being dropped in previous models. Given that Apple isn't prone to making U-turns, we're not holding our breath that it'll miraculously return. Another big design upgrade users can expect to see is an all-glass body, instead of Apple's traditional aluminium models. One of the most exciting possibilities behind this design choice is that it could allow users to charge their iPhone 8 devices wirelessly. There are even images floating around the internet of wireless charging components supposedly headed for the iPhone. Could the days of stretching your power lead for bedtime browsing be over? Will we see a return of the much-missed headphone jack? Topping off the list of rumoured design changes is the idea that the iPhone 8 won't have a physical home button. This ties into the prediction that we're headed for an edge-to-edge screen. So where would the home button live? The likelihood is it will be replaced by an on-screen home button, or could be bumped to the back of the phone just like the Samsung Galaxy S8. However, there's also the option that the home button could be situated on the side, like the sleep/wake button found on certain Sony phones. And if we're going all out on speculation, there's even a possibility that Apple could forgo fingerprint censors and rely on facial recognition to unlock. This would be a huge shake up, though, for the iPhone, so we're going to file this under 'unlikely'. For the latest information on the iPhone 8 launch, release date, price and more, head over to our sister site TechRadar.